Some things seen cannot be forgotten. March 13th, 1997. Bright, odd lights appear hover over Phoenix, Arizona. No one knows for sure what they are attributed to, but some in the city believe them to be UFOs. One of those people is Josh (Luke Spencer Roberts). He, along with friend Mark (Justin Matthews), and love interest Ashley (Chelsea Lopez) decide to take it upon themselves to find out exactly what happened. But, the three go missing days after the sighting, with nary a sign as to what happened. Now in 2017, Josh’s sister Sophie (Florence Hartigan) is committed to solving the mystery of what happened to her brother and his company, going off of the documentary-style tapes that were left behind. The most noteworthy thing about Phoenix Forgotten, a movie American moviegoers probably didn’t forget but rather, just not cared for based on the box office reports, is one of its co-producers being the legendary Ridley Scott. The producer connection seems to be in name only, going no further than an Easter egg featuring the Xenomorph on a poster. 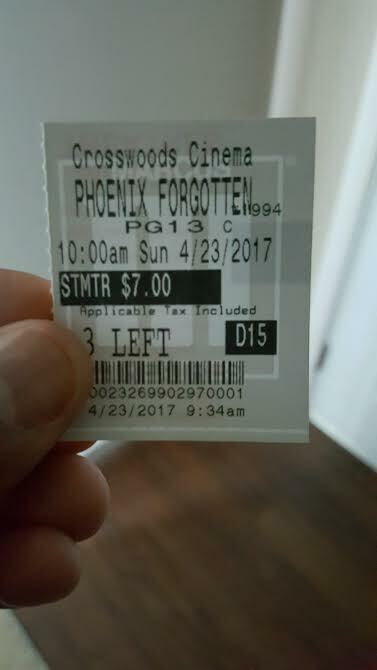 So that leaves Phoenix Forgotten as a traditional found footage movie more or less, not scraping the bottom of the genre barrel but not exactly leaving an imprint, either. Almost any film in this genre ilk is going to be compared to The Blair Witch Project, fairly or unfairly. Really though, the story presentation of Phoenix Forgotten is a little Sinister-lite with mockumentary style injected, so not entirely found-footage delivered. In his first full-length feature, director Justin Barber toggles the first 40-50 minutes of the runtime between the present and the past, having Josh’s sister play her missing brother’s tapes and trying to piece together what exactly happened. The present-day scenes are adequate, but the fun exists (for a little while) in seeing the late 90’s recreated through the granular tapes and audio effects. To an extent, the particular story with these three teenagers does feel like it could have actually happened, which is a credit to Barber for balancing an actual real event with mostly fictional characters. After around this 50 minute benchmark, Phoenix Forgotten transitions fully into the mode one expects it to. The film’s final act isn’t without a few thrills, but in the process ends up casting its main character/narrator aside and never brings her back. Which is odd, if only because the movie teases the question that what the audience is viewing cannot get out to the public, only for that possibility to go nowhere. As such, Phoenix Forgotten ends with a “That’s it?” type of feeling. Barely being 80 minutes doesn’t really allow for signature character exploration. 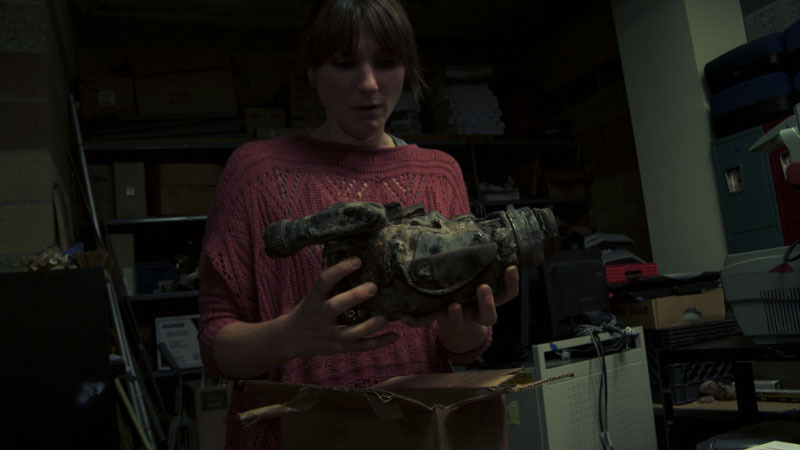 Phoenix Forgotten looks more at the idea of conspiracy obsession and the basics of how a family, especially a husband and wife, can be pulled apart after a terrible incident. Playing the father and the mother, respectively, Clint Jordan and Cyd Strittmatter do an excellent job of portraying parents who struggle to cope everyday with a missing child. Although relatively brief, their character work is noticed. However, the four crux characters are surprisingly pretty forgettable—in part due to the lack of aforementioned runtime—but also in part because the cast playing them does so in the most bland of fashions. Outside of a few impressive moments from Chelsea Lopez, it’s hard to see anyone in this foursome getting increased high-profile work from their work here. Even with a little of successful early movie genre subversion, Phoenix Forgotten doesn’t rise, as it eventually settles into the same repeated ashes and clichés that make up the genre it belongs to. Photo credits go to comingsoon.net, buzz.affcart.com, and blastr.com. I’ve seen the trailer twice before recent movies I’ve seen, but I can’t recall seeing a TV spot. This had terrible marketing, but maybe because it’s pretty average? No need to waste even $6. True it isn’t bad, but this will be on Netflix before the summer’s over. They recreated those lights this year at SXSW – trippy. I need to go to this one day. On the bucket list!